Selena Lasota surveys the field. The junior will look to lead Northwestern as it attempts to bounce back in 2017. Northwestern hasn’t won a national title in four seasons. That streak may seem trifling, but for a team that won seven out of eight NCAA Tournaments between the 2005-2012 seasons, it’s cause for concern. A year ago, the Wildcats found themselves on the brink of not qualifying for the NCAA Tournament. 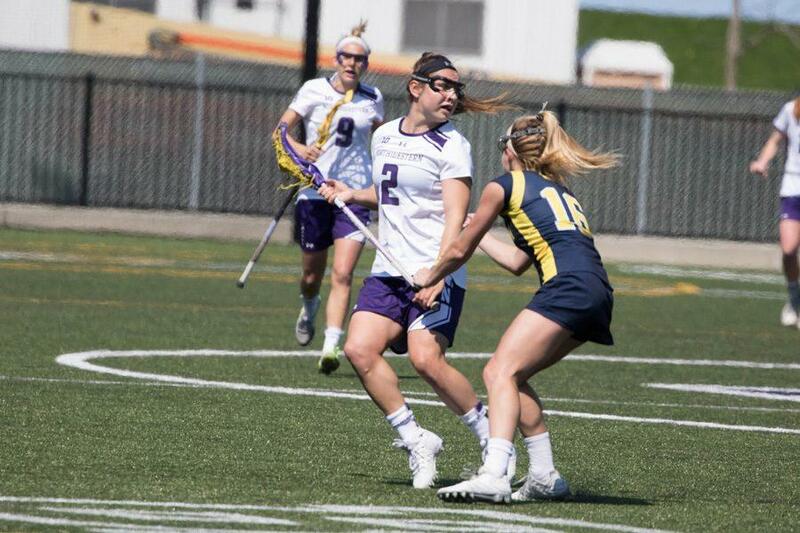 NU managed to claw its way into the postseason after making a run to the Big Ten Tournament championship, but the team couldn’t overcome Notre Dame in the second round and lost 15-3. As the Cats look to recapture former glory, coach Kelly Amonte Hiller wants to learn from past mistakes. But NU’s road to relevance will include a few speed bumps along the way. The team will be without last season’s leading scorer Kaleigh Craig, who tallied 67 points last year before graduating. Craig was the catalyst for the team’s offense, scoring 53 goals and bringing a sense of consistency to the Cats’ rollercoaster season. Without Craig, the team will turn to junior midfielder Selena Lasota, who has scored a combined 119 goals in her first two seasons with NU. Lasota said she is hoping to build off past success, but added she won’t be alone in making up for the scoring void that Craig left. The team will benefit from the return of senior Sheila Nesselbush, who scored 9 goals in four games before suffering a season-ending injury. Though she spent the majority of the 2016 campaign on the sidelines, Nesselbush believes she benefitted from watching her team go through last year’s turmoil. Amonte Hiller said Nesselbush is one of the team’s top offensive midfielders, and having her back in the lineup along with Lasota and senior attacker Christina Esposito, who scored 4 goals Monday, will be pivotal for NU’s success. The team is also looking forward to a new 90-second shot clock instituted by the NCAA. Several of the Cats, including Lasota, are already used to playing with the shot clock because of indoor box-lacrosse. But none are more excited than sophomore goalie Mallory Weisse, who said the shot clock will cause teams to take fewer quality shots. NU got off to a shaky start in its season opener against Canisius. Weisse allowed 7 goals, but the Cats still secured a narrow 9-7 win. The team will have a chance to make a statement Sunday against Notre Dame in a rematch of NU’s season finale. Weisse said it is critical to take the season one game at a time, leaving her team with a message going into the season.